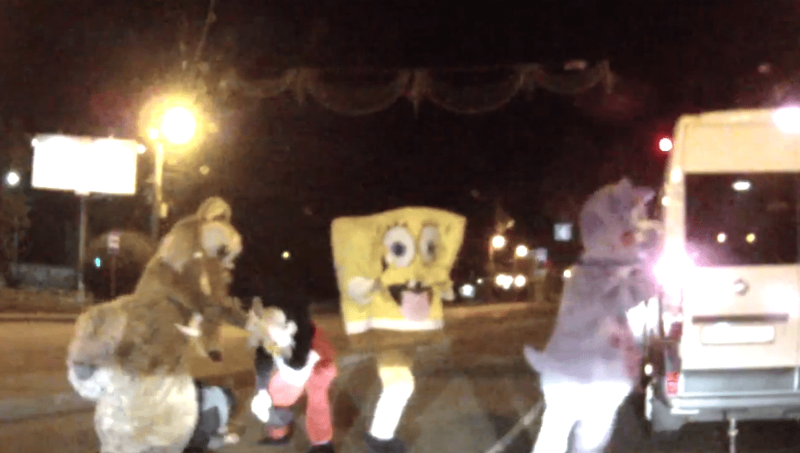 Spongebob Squarepants proves furries can put up a fight. When it comes to road rage, sometimes you need to see it to believe it. Below, we’ve found some of the best road rage videos on the Internet. Whether they’re about road rage karma or out-of-control collisions, each has something to offer. While not necessarily rage-induced, this incident shows a slew of dressed-up cartoon characters making trouble. They hop out of a van, approach a driver, and go wild. This video might not make much sense, but it definitely deserves a Top 10 spot, for us. While this video doesn’t feature the lead-up, its actual action is pretty intense. An MMA fighter’s car is assaulted before a turn, resulting in a sidewalk brawl. Road rage isn’t necessarily bound to highway chases. Sometimes, it gets personal. Sometimes, road rage caught on camera can show how outrageous an encounter can get. Another physical altercation case, this Hialeah road rage case ended with one man assaulting another with a baseball bat. One driver tried changing lanes, but another wouldn’t let him. Interestingly, the brawl breaks down in the middle of a crowded street. This video gained quite a lot of popularity on social media in June, and it’s one of the more spontaneous road rage incidents making the rounds. In this video, a YouTube video captures a road rage bout via GoPro. A red truck blows past him, and the following conversation escalated quickly. The truck’s driver begins waving a pistol, resulting in an interesting conversation. Started by a motorcyclist, this video’s crash is definitely the result of road rage. The cyclist’s driver cuts off another driver, kicking the side of a car. Unfortunately, the resulting crash is violent. The victim’s car bounces off the highway’s barrier, t-boning another car during heavy traffic. Another video featuring a motorcyclist, this YouTube find covers a roadside assault. The motorcyclist cut off a driver, who then approaches the bike. The driver begins punching the motorcyclist—who captures the video via GoPro. In this video, we get a motorcyclist’s point of view. A white sedan speeds through streets, weaving around other vehicles on the wrong side of the road. Devin Jones, the bike’s driver, follows the driver to capture footage. When the driver outmaneuvers him, however, the motorcyclist abandons his chase. Eventually, the two reconnect. Jones meets the passenger in a Walmart parking lot, and insults are exchanged. You can guess what happens next. Sometimes, road rage escalates to the point of physical violence. In most cases, it extends well beyond the two parties involved. Some of these videos show road rage instant karma, while the others simply capture maneuvers gone wrong. At the end of the day, viewing road rage videos helps. Road rage is a spontaneous reaction, and it can’t always be pinned down with logic. Whether it’s a Walmart parking lot or the center of a highway, a road rage arena is always dangerous for anyone involved. If you have the time, check out a few compilation videos. Once attuned to spotting the signs of road rage, there is a better chance of avoiding the situation before it occurs.